Partnership between InfoComm and AV User Group expects to benefits both sides during three-year collaboration, starting with four key verticals. InfoComm International and AV User Group have signed a deal that promotes collaboration among the organizations and awareness of both. Integrators understand today that end users are becoming an increasingly important part of the technology equation as many are increasing their focus on service over boxes. That’s just one reason InfoComm International is working closely with AV User Group. The organizations announced their collaboration last week, saying they plan to work more closely on “initiatives to increase AV industry awareness among enterprise decision-makers and foster stronger relationships between the companies and professionals that build AV solutions and the businesses and institutions that operate and benefit from them” in a deal that runs through 2019. InfoComm will sponsor and present at AV User Group events and AV User Group will work with InfoComm on networking events for end users at select trade shows. InfoComm and the AV User Group have agreed to “promote each other’s efforts in various ways, including through online resources for collecting expert insight and discussing topics of interest, and to host and/or participate in new and existing InfoComm and AV User Group activities around the world,” according to the announcement. “We’ve known each other as organizations for quite some time,” says InfoComm International chief global officer Terry Friesenborg, noting the groups partnered on a conference at ISE 2017 in February. 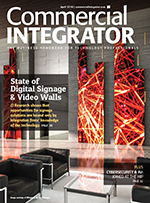 “As InfoComm looked at its strategic plan, we realized we’re an industry association, both for the trade side and the professional side,” he says. One of the areas of focus in the latest strategic plan is “awareness of the industry among end users,” and that will start with AV User Group in four markets in 2017: finance, higher ed, hospitality and retail. They’ll add two more focus markets in each of the next two years, says Friesenborg. “We wanted to talk to them in their world and make it more of a peer-to-peer thing,” he says. Although AV User Group is based in London, its reach has expanded to New York and Hong Kong since it started 21 years ago, says chairman Owen Ellis. InfoComm now has nine trade shows outside the U.S. and 30 percent of its members outside the States. AV User Group has about 650 members, half in London, and hosts four events in New York and three gatherings in Hong Kong every year. Friesenborg traces the genesis of this partnership to ISE a couple of years ago, when InfoComm heard from several prominent manufacturers about the importance of connecting with end users at trade shows. “We can understand the needs of the end user community, not just the technical needs,” says Friesenborg. “A lot of end users are looking for outcomes and the trades sometimes have difficulty understanding that. “There’s such a natural synergy between our groups, while still maintaining a level of independence,” he says.